The Dewulf ZKIV is a self-propelled 4-row top lifting harvester with discharge elevator that can harvest under all conditions. 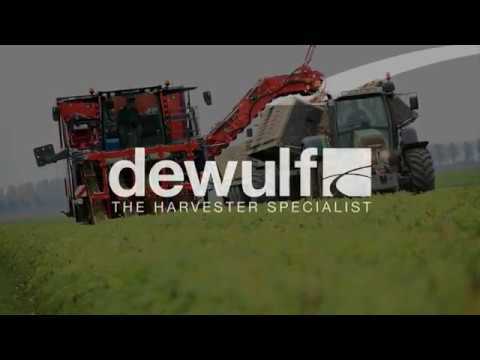 Dewulf is the first machine builder to have developed a top lifting harvester in which the harvesting elements are located ahead of the front axle and have a capacity of 120 tonnes/h for fresh food shop carrots. The machine also excels in terms of its low impact on the crops and soil. With the 12 650 mm long super-grip profile harvesting belts, the carrots are suspended uniformly and accurately in the harvesting belt unit. The ‘Floating Shares’ are a unique feature: two individual harvesting elements with independent harvesting shares, whereby maximum stability is guaranteed, even at high driving speeds. Two 900 mm tracks ensure minimal ground pressure, which minimises impact on the ground. The tracks are hydraulically driven and provide the best traction available on the market, enabling you to harvest in all ground and weather conditions. The standard DAS (automatic steering), which is accurate to 2 cm, makes harvesting with a ZKIV even more enjoyable.